The Renaissance City Winds’ Young Composer Program is supervised by resident composer R. James Whipple. Students are introduced to just enough music theory to stimulate their creativity; the purpose of the program is for students to understand the process of composing by doing it, and for the student to have a performable piece of music by the end of the project. Students as young as sixth grade have an amazing capacity for generating melodic ideas, and the program gets them to accurately write down their ideas in correct notation, and then to organize their ideas into coherent forms. Professional composers working on a given residency then arrange the completed pieces for either student performers on the Renaissance City Winds to perform on the concluding concert of the residency. If built into the residency budget, the Winds can also record the pieces for radio broadcast. Almost 100 finished pieces have been produced since the pioneering residencies with Merging the Classics and Hampton High School in the late 1990s. Funding: in Pennsylvania, should be designed in conjunction with RCW school residency to fit guidelines of AIE funding. That means at least three core groups. Here are some examples of the wonderful music created by young students. 1) Clouds. This was created during a fairly short residency in College Park Elementary School in Beaver, Pennsylvania. 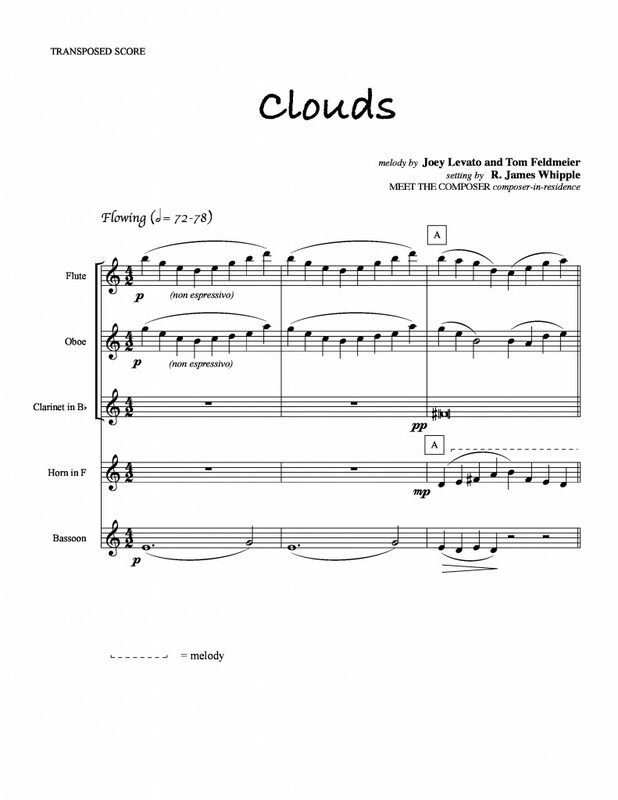 Two sixth-grade general music students, Joey Levato and Tom Feldmeier, wrote the melody; R. James Whipple provided the harmony and scored the piece for wind quintet. 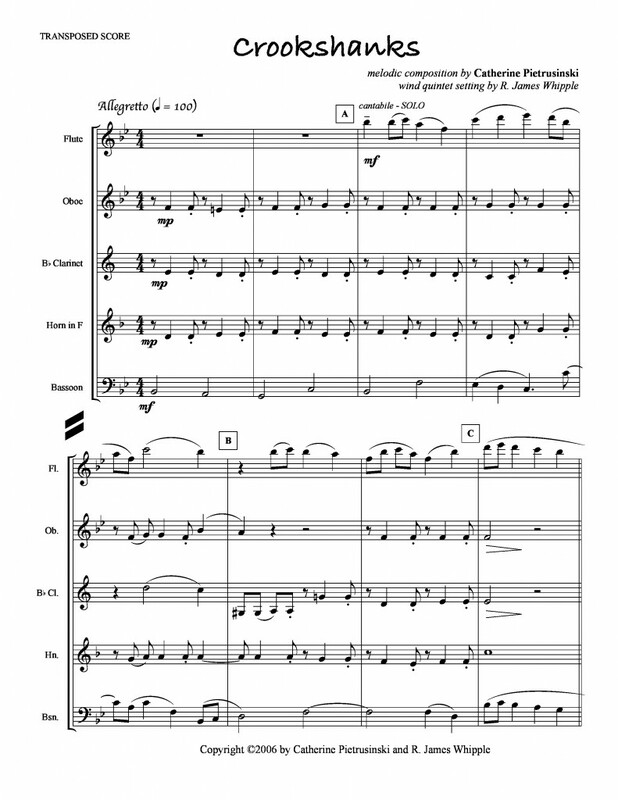 This was performed on the MEET THE COMPOSER showcase for the 2004 National Performing Arts Conference held in Pittsburgh, and recorded for broadcast by WQED-FM. Here’s the first page of the score, for a recording, see SoundCloud. 2) Crookshanks. This was written through the last year of Merging the Classics in 2006. Catherine Pietrusinski was in the eighth grade at Holy Spirit School in Millvale. She was a flutist, so her principal theme was given to the flute in R. James Whipple’s setting. Catie created a ternary form for her piece, with interesting imitative and sycopated material for the “B” section. The Renaissance City Winds recorded this for broadcast at the Carnegie Free Library and Music Hall in Carnegie, Pennsylvania, in 2007. Here’s the first page of the score, for a recording, see SoundCloud.